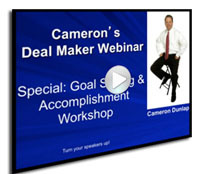 During an approximately 90 minute training, Real Estate Expert, Cameron Dunlap presents a very special Deal Maker Webinar. 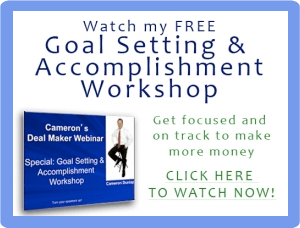 This Goal Setting Workshop is designed with one thing in mind – getting you focused and on track to make more money… Watch this free replay now! 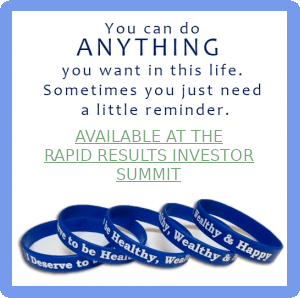 Do want to achieve more in your personal life and in your business? Do you set goals for yourself? How do you plan to achieve them? Will you be motivated and follow through? Will the people around you stand in your way? How do other people become successful? What do they do differently? I’ll addres s each of these in this training. This webinar is pure motivational content that you won’t want to miss. I suggest you also invite your friends, business partners and anyone else you can think of who may benefit from this powerful FREE training. Remember, this is a content webinar designed to get you focused and knowing exactly what to do to make this a record year. I plan on this being my best year ever – come along with me and make it your best ever too! Watch this free training NOW! I really feel motivated and think like help is so near and real. thank you Cam. I am motivated and always searching for real estate business opportunity to be investor or property owner. We had one -4 unit apartments in 2004, but I had so sell quickly because there was a negative rent. although my sister was the one on the loan, only hen name on the loan, but the negative rent was very high. We made profit on the selling and just in time that my mother passed away and needed the money for the final expenses. Thanks Cam for sharing and caring, I’ve written down some goals , I would like to walk away from my job with in the next four years. I’m 56 years old now , if i can do it in half the time that would be great. that means I will have to make a 150,000.00 a year in wholesale and flips. Now I must go dig into my Dash board and learn this Iflip thing. thanks and may you and your family stay BLESSED! Copyright ©2012-2019 I Deserve To Be Healthy, Wealthy & Happy.